Within the Geopark we have an array of important habitats and species on our doorstep; from caves to ancient woodland and sandy shore to limestone grassland. The area is a hot-spot for wildlife - its warm climate, unusual geology and sheltered aspect mean that many species flourish here that are more used to Continental temperatures! 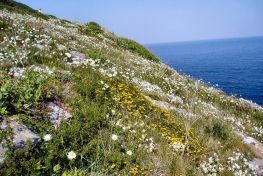 Specialist plants live on the thin, dry limestone soils; unusual marine life inhabits underwater reefs and submarine caves; rare birds find homes on our cliffs and farmland fringes; and invertebrates like the Jersey Tiger moth provide a splash of colour in gardens and nature reserves alike. This distinct and varied landscape not only contributes to the biological and geological wealth of our planet but drives our local economy and improves our quality of life. Follow the links in the menu to discover more about the local species and habitats that have been highlighlighted within The Nature of Torbay a forward thinking document that fully integrates biodiversity and geodiversity. English Nature has classified the area as a "Prime Biodiversity Area", one of 120 across the country. There are 12 nationally important Sites of Special Scientific Interest (SSSI) in the Geopark. 10% of the national population of Cirl Buntings breed in the Geopark. The waters of Tor Bay are designated a Sensitive Marine Area; 77% of the coastline is designated as SSSI or County Wildlife Site (and the Torbay Coast and CountrysideTrust protects the majority of these sites). The Geopark is an internationally-acclaimed geological site. Ten nationally rare plant species are found in the Geopark and 28 nationally scarce species. Despite its mainly urban character, 46% of the Geopark is undeveloped.